Now i am going to explain about how to create responsive table using css3 and jquery. 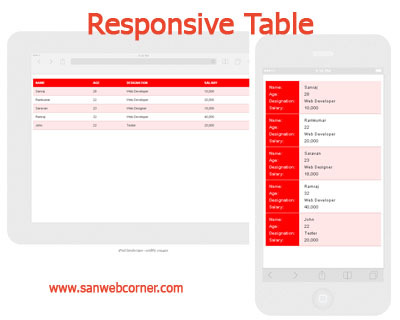 The responsive table is some tricky because of the width of the table is based on the number of datas (records). So we can't able to maintain that much of records in that particular table format in mobile view or smaller devices. So that will rearrange the format of the table when it comes responsive. The above Example is one of the best responsive table because it shows the table in different format in responsive view.If you enter n number of records also it shows perfectly when responsive. You can change the css code according to the your website.